Having to evacuate with little notice is never a pleasant experience. However, with the right preparation and the right essentials in place before you need them, you can better ensure you’re ready for anything, and able to handle an extended stay away from home. That’s why a bug out bag is such an important part of survival preparation, letting you leave as quickly as you can, as safely as you can, on any amount of notice. There’s a lot that goes into being prepared, so here are our thoughts on essentials for a really effective bug out bag. Access to clean water is particularly important when you’re forced to evacuate your home on short notice. That’s why it’s so important to make sure that you’ve got the right supplies readily stored in your bug out bag, safe in the knowledge that you can leave quickly, without having to worry about access to hydration as the days go by. Enough water is one of the most important additions to a bug out bag. However, water can add significant weight and take up a lot of space. Because of this, it’s important to decide how long you’d like your bug out bag to last — A three-day bag could contain 3-4 litres of water, for example. Consider a combination of plastic water bottles, sealed water pouches, and water purification tablets. You should also consider bringing a stainless-steel water bottle, alongside a water filtration straw. This means that, in a worst-case scenario, you’re still able to stay hydrated — You can boil water in the steel water bottle or use the tablets or filtration straw to safely drink water if stuck in the wilderness for any reason. Food is another key consideration. However, it’s crucial that you make use of the limited space in a bug out bag effectively. This means you should bring food that’s easy and practical to store, while also keeping weight down. Avoid metal tins, bulky foods, or foods with a lot of packaging. If possible, consider transferring food into plastic bags for easier storage. Things like rice, beans and mixed nuts are perfect nutritious foods that store easily. High-energy protein bars are also fantastic for a quick and energising snack when you’re on the go and don’t have time to rest and eat. To keep weight down, you should also avoid cutlery and cooking utensils. Instead, pack one lightweight, collapsible pan, and a metal dish to eat from alongside stainless steel camping cutlery which often fold up and save space. 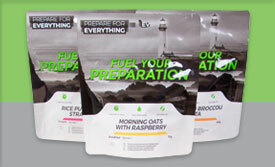 Freeze-dried meal pouches can also be a particularly efficient bug out bag essential, as they’re easily prepared, easily stored, and contain a full meal’s worth of nutrition, which makes travelling with several days’ worth of food much simpler. 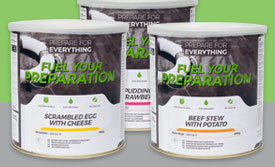 Another key benefit of freeze-dried meals is that they can be eaten from the pack, which means preparing and eating food while on the move is simple, and no cooking utensils are needed. Having to evacuate for any length of time can be a bit overwhelming if you’re not prepared for any eventuality. That’s why your bug out bag should contain certain essentials that will help to keep you warm, dry, and safe until you can return home, or arrive at suitable long-term shelter. Additional clothing is always important, as you can never be sure when the weather can suddenly turn. Make sure you pack a sturdy raincoat for when the weather worsens. Consider packing an extra shirt, trousers, and an extra thermal under layer. Quality socks are also crucial for keeping feet warm and dry and avoiding problems which can slow you down and hinder movement such as blisters, which can severely hamper your walking pace. Shelter is also an important consideration. This will depend on your location, what you have available, and how long you’ll be away from safety. For example, if you have a car, or know of several suitable locations, a warm, easily-stored sleeping bag will suffice. Alternatively, one-man tents collapse into a convenient size for travelling with, making them a perfect option for shelter in the wilderness. Knowing you have enough provisions for several days can be immensely reassuring, especially when you can never be sure what might make you leave with little to no notice. 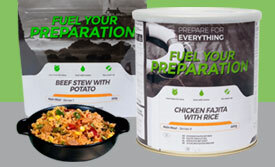 With such a wide variety of meals and ingredients to choose from, we can provide you with exactly what you need to help create the perfect bug out bag.